Season’s Greetings! May your holidays glitter with unforgettable moments of happiness, laughter, and good cheer. In warm appreciation of our past association, we extend our very best wishes for a happy holiday season. 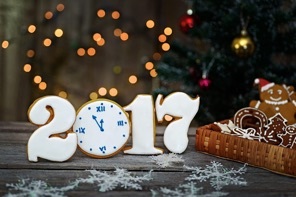 Here’s wishing you, a safe and peaceful holiday season and a happy and prosperous New Year. A rotameter is a flow measuring device that belongs to a group of instruments called variable area flowmeters. For decades Variable Area flowmeters have become established in industrial measurement technology with an economical, mature measurement principle. The Variable Area flowmeter is an instrument for metering the flowrate of liquids and gases in a pipeline. It includes a vertically oriented conical tube, whose diameter is larger at the top than at the bottom, through which the fluid flows upward and in which a vertically moving float is positioned. 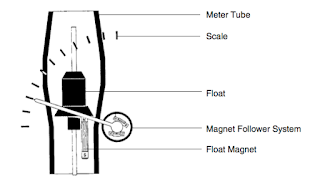 The height of the float in the tube increases as the flowrate increases in such a manner that the resistance to the flow is always balanced by the weight of the float and remains constant regardless of the flowrate. 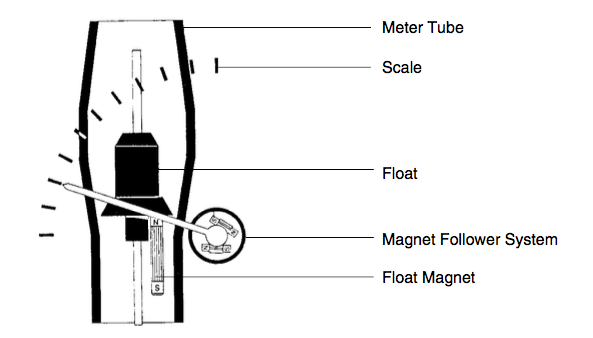 The height of the float in the tube is a measure of the flowrate. 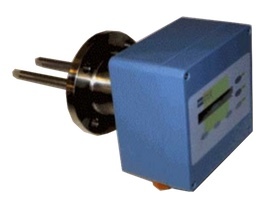 The value of the flowrate can be read from a scale. Variable area flowmeters are the most cost effective solution for almost all applications involving the measurement of industrial process liquids, gases or steam. They meet the application requirements by featuring a wide range of design varieties and sizes. They offer a long life and high reproducibility. 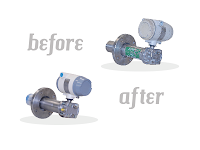 Variable area flowmeters are excellent mechanical back-up meters because no external power supply is needed. For more information on rotameters (variable area flowmeters) visit http://www.teco-inc.com call TECO at 800-528-8997. Don't let this happen to your old flowmeters! Here's a video parody of the popular TV show "The Twilight Zone", only here it's the "Magmeter Zone", where old, worn out magmeters go to die. From the creative minds at TECO ... humor in magnetic flowmeters - who woulda thunk it? Enjoy! 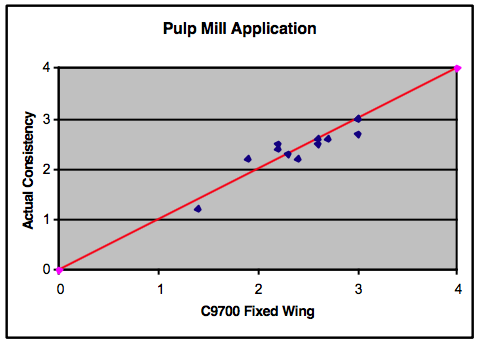 Pulp Mill Consistency Measurement Requires Accurate Measurement over a Wide Range of Consistency Levels. The overall throughput (TPD) of the fiber line is traditionally calculated from a single consistency measurement device. This measurement must be accurate and repeatable. C9700 Fixed Wing Consistency Sensor. The TECO C9700 Fixed Wing Consistency Sensor is designed to accurately measure over a wide consistency range, including low consistency swings from variations in blow tank levels. This sensor has proven consistency ranges from 1.5 % to 7.0%, over a wide range of velocity (flow) rates. 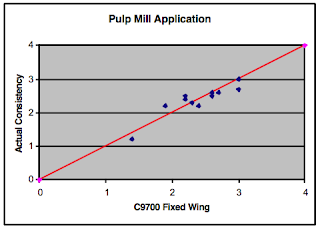 As an example, the above graph displays the results from a southern kraft pulp mill application, after the blow tank, prior to the defiberlizer. Who is it Important to? 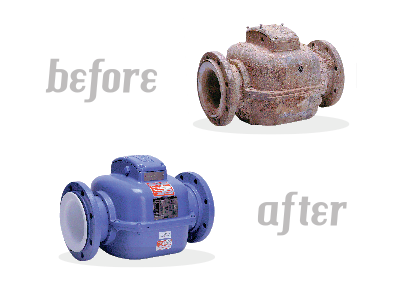 See the dramatic change of flowmeters and instruments before and after the TECO repair and remanufactured process. The TECO HK Series microwave consistency transmitters provide a versatile, safe and easy-to-calibrate means for measuring the consistency of paper stock. The HK Series can successfully measure broke, recycle or other difficult fiber types, independent of fiber length, freeness or wood species. Typically less than half of the cost of other microwave transmitters, the HK series microwave transmitters will measure the percentage of total solids of additives in water and percentage of moisture in wood chips with the same transmitter. Applications include measurement and control of machine, recycle & broke stock, measurement and control of % totals solids of starch additives, measurement and control of % solids (limestone, kaolin clay) in coatings. No routine maintenance required. Install & forget! Versatile – Same transmitter can be used in Pipes, tanks, chests, belts & chutes. Millions of dollars each year are spent unnecessarily throwing away old flowmeters and process instruments. Companies aren't aware of a cost-effective alternative that doesn't impact product performance or quality. That alternative is "remanufacturing" - a process that restores process instrumentation to factory specifications and many times provide a "better than new" instrument - at a fraction of the cost of buying new. TECO, based in New Orleans, established a strong reputation and very loyal customer base becoming the world's largest "remanufacturer" of flowmeters and many other types of process instruments. Their business model and process is unique and elegantly simple. You send your flowmeter or instrument to TECO along with your contact information. Within 48 hours, TECO diagnoses the overall condition and outlines the problems with your device, and provides a quote for the restoration. If unrepairable, they quote a stock "remanufactured" direct replacement. If they can't restore, or provide a remanufactured unit from stock, they will competitively quote a new replacement. Their repair / restoration process is top-notch. Experienced TECO technicians tear down the item and begin rebuilding it from the ground up. Parts are disassembled, cleaned, sandblasted, painted, and re-assembled. Electronics are repaired or replaced and then fully tested to factory specifications. The unit then goes through a NIST traceable calibration from a ISO/IEC accredited lab and all documentation is recorded and provided. Check out this light-hearted, 3 minute presentation on the virtues of TECO remanufacturing and repair services. Production Superintendents, Machine Superintendents, Process Engineers, Machine Operators .... if you have basic paper machine production responsibility, you should look at this slideshow. A Freeness Analyzer is an on-line, in-process field instrument used as a production orientated tool that directly measures drainage rate (freeness). It operates on the basic principle of how easily water will drain through a pad of fiber. Approximately every 30 seconds, the Freeness Analyzer measures the rate of filtrate flow through a fiber pad. Once the freeness has been determined, air pressure is increased to return the filtrate and fiber to the stock line in preparation for the next cycle. At the same time, flush water is introduced into the chamber to clean the screen and interior of the chamber. This information is regarded as a “window” into the process as an indirect measurement of fiber quality. 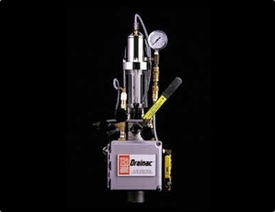 The TECO Drainac is the only freeness measurement device that actually measures the true drainage rate, or from the papermaker’s standpoint, actually measures the drainage of the stock on the forming fabric. Water and wastewater treatment facilities have complex operational processes, which involve a wide range of flow measurement tasks. These applications demand the highest flow meter accuracy and reliability, as well as long-term stability and a low cost-of-ownership. In the oil and gas industry, the flow of liquids and gases must be measured during every phase of exploration, production and transportation. Upstream operations span offshore and onshore activities, including well testing, enhanced oil recovery, fractionation, completion, and separation to recover and prepare crude oil and natural gas. Badger Meter products are used across the entire hydrocarbon sector — from upstream production to feedstock for the intermediate stage and downstream processing — in applications ranging from catalyst injection and gas flow measurement, to batching and blending, custody transfer and fugitive emissions monitoring. You and your customers expect peak performance every day year-round from your HVAC, hydronic chilled/hot water applications and irrigation systems. Products provide accurate measurements, energy calculations and integrated data communications to increase your building’s system performance. A variety of highly accurate and dependable flow measurement solutions for the demanding test and measurement market. 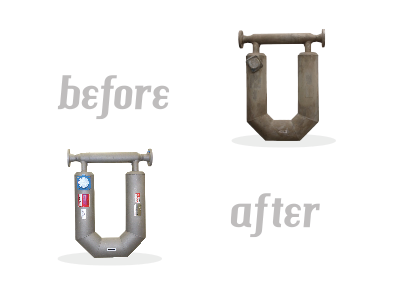 Many companies don't realize that when you have a failed magnetic flowmeter or mass flowmeter, it's often more cost-effective and efficient to have them restored to mint condition than it is to replace them with new units. But if you send meters to the original manufacturer, they can disappear into their system for weeks or months. And you have no idea how long it will really take, or if it will fail again later from undetected problems. The fact is you can't afford the loss of productivity or downtime. But what if there were a place you could send broken flowmeters that could save you money and time by restoring them to pristine condition. A cost-effective specialist who could guarantee rapid turnaround time and premium customer service. A team of experienced professionals with the capabilities to keep equipment in service, even if it's no longer supported by others. For a proven partner like this, there's only TECO. Established in 1947, TECO has become the global leader in restoration and customization of magnetic flow meters, Coriolis meters, and other process control instruments. At TECO, they understand that time is money, which is why they provide the fastest turnaround time in the industry. TECO doesn't simply repair a broken part in return it, they do a full restoration and back the whole meter with a full warranty. TECO quality control includes NIST traceable flow calibration, which is often required by regulatory agencies and ISO 9000 standards. TECO also provides independent calibration to serve your preventative maintenance and metrology needs. While their low-cost, high-quality work has made TECO the industry leader, it's their commitment to premium customer service that keeps their clients loyal. Extensive capabilities combined with a focus on service also means TECO can manufacture custom flowmeter solutions to meet the demands of severe applications. It's all part of the package with TECO. 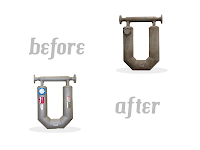 If you have failed magnetic flowmeters, Coriolis meters or other instruments, call TECO. After receiving your equipment, we'll turn around a quote in 48 hours or less. No return authorization required. To develop a customized solution for your your toughest application, contact TECO. Welcome! We hope (over time) you find this blog useful and it becomes a trusted resource for you to gather information about process control, instrumentation, valves and valve automation, and methods for saving costs through maintenance and service. 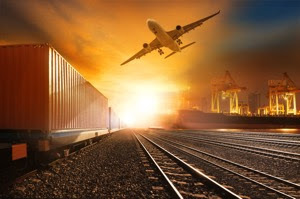 We plan on weekly blog posts highlighting innovative process control solutions, insight to how industrial controls work, and new products that solve tough engineering challenges.